Hey! I haven't blogged in awhile but I figured now is a good time to do it before I get too bogged down with other things. You know I'm always up to something right? Well recently I've been writing and recording music for a Hip Hop Artist named "STARKS!". Since then we have received pretty good reviews and have been apart of "The Rebel Radio Show" in Detroit Michigan 3 times now. I even wrote some lyrics for as well as "rapped" on a track with STARKS!. You guys can check it out on my myspace music page www.myspace.com/rekcahdam ! I've also been doing a little bit of artwork here and there. 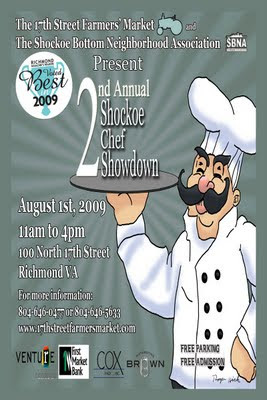 I was asked by the 17th Street Farmers Market to do a banner for an event they had called the "Shockoe Chef Showdown" since the normal graphics artist moved on to do other things. Heres what I came up with in a short period of time. To my surprise the poster was also featured in Richmond magazine as well. It makes me wish I would have put some more work into it LOL. O well, people seemed to like what I did with it. Lastly, about 2 months ago, I was contacted by the Marketing Manager of a company called Wild Pockets . He was interested in having the WoA Team port Wings of Apocalypse to their platform. After over a month of negotiations we have finally come to an agreement and we will be developing a port/ revamped version of Wings Of Apocalypse for the Wild Pockets Online platform. We'll also be creating a new blog for the new version. STAY TUNED! that rapper STARKS! sounds like something crazy lol.